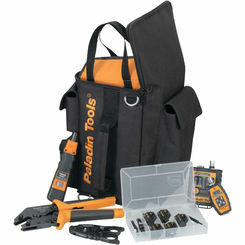 Buy the best in electrician tool sets right here at PlumbersStock and save. 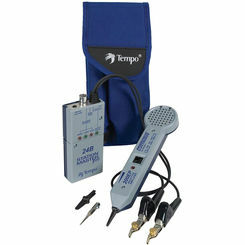 Electrical work requires very unique electrical tools, from crimpers, to fiber tools, to compression tools, and more. 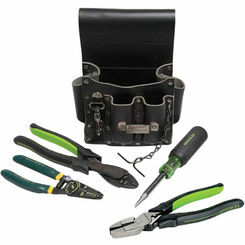 The right tools will help ensure you get the job done right while taking the proper safety measures. 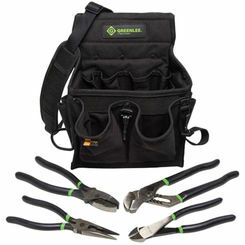 We proudly carry electrician tools and other fantastic hand tool sets from name brand manufacturers like Greenlee, Malco, Regal, and more. At PlumbersStock, we carry tools specifically designed to help you perform electrical jobs. From installing new wires or fuses to connecting new outlets and circuit breakers, electrician tools allow you to get the job done safely and properly. Looking for a certain tool? Use the filters on the left to search by manufacturer, style, use, and more to narrow your results and find the perfect tool to add to your collection. 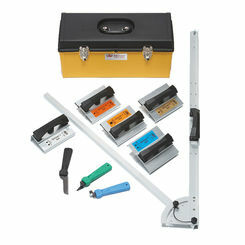 Electricians use a wide variety of tools to complete jobs safely and efficiently. 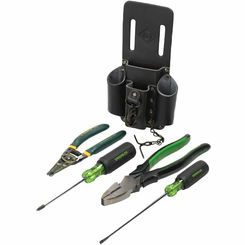 While some tools are specialty tools used primarily in the electrical field, others are common household tools and can be found in any handyman’s collection. 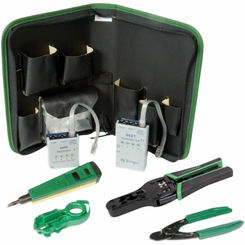 Specialty tools include items such as crimping tools, voltage detectors, electrical test leads, and wire strippers, to name a few. 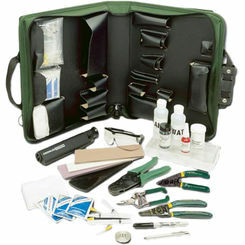 Non-specialty tools include screwdrivers, pliers, and scissors. Here is a list of some of the most commonly used electrician tools that every do-it-yourselfer should have in his or her toolbox. 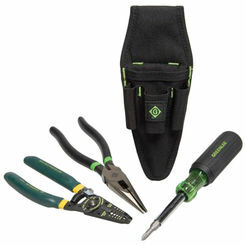 Pliers – Two of the most commonly used hand tools electricians use for many of their jobs are side-cutting and needle-nose pliers. 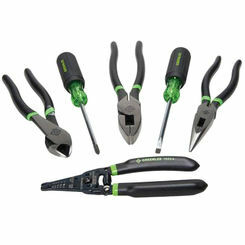 Side-cutting pliers can be used for heavy-duty cutting and connector crimping, while needle-nose pliers can be used to cut and bend small wires in tight, hard-to-reach areas. 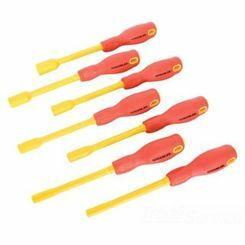 Screwdrivers and Nut Drivers – Both screwdrivers and nut drivers are used to work with different kinds of fasteners, screws, and nuts. 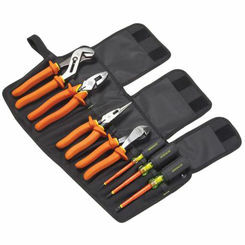 In the electrical field, screwdrivers come with special insulated handles and non-conducting shafts designed to work with “live” equipment. 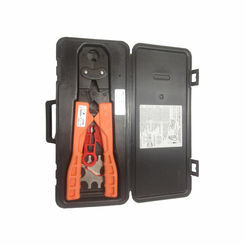 Wire Strippers – Probably the most correlated item with electrical work, wire strippers are designed to remove insulation from the cut end of an insulated wire. High-quality models include curved handles to reduce repetitive motion fatigue and a thumb guide for increased comfort and quicker wire stripping. Fish Tape (Draw Tape) – Fish tape, also known as draw tape, is used to route new wiring through walls and electrical conduits. 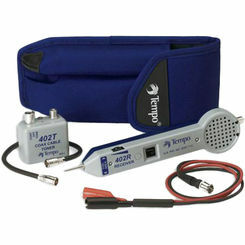 Fiberglass versions of this tape are ideal for working around live circuits while steel versions are best for short wire runs under carpet or through insulation. Fish Poles – Fish poles are tools used to push or pull wires over long distances, for instance through suspended ceilings. 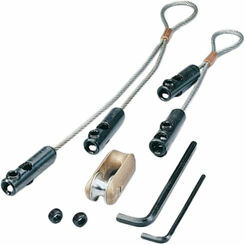 These tools have a specialized hook that can be used to install wires in suspended ceilings and are non-conductive for safe use. 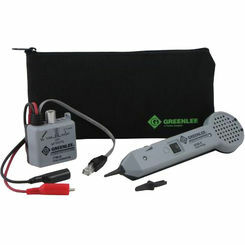 Voltage Detector – These tools are unique in that they are used to check for live circuits. 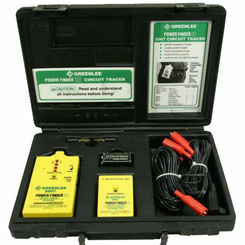 Voltage detectors come equipped with a light-up bulb (usually LED) that lights up when it detects live circuits. 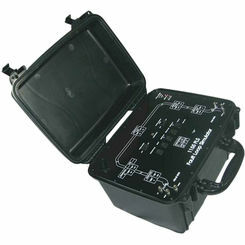 Volt detectors can detect different ranges of voltage anywhere from 50 – 1,000 volts AC (alternating current). 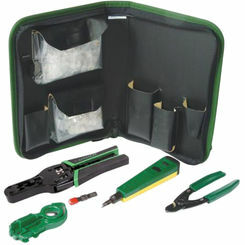 This makes this tool the ideal companion when checking voltage in cables, cords, circuit breakers, lighting fixtures, switches, outlets, and wires. 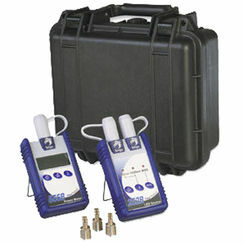 Laser Measuring Tools – This tool allows the user to measure a distance using laser technology. 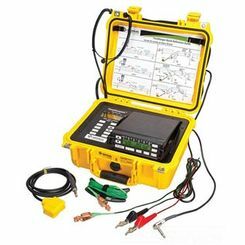 Laser measuring tools can also be used to create precise lines or points that aid in planning future electrical systems that are accurate and level. There are three basic types of laser measuring tools: Line lasers, Point lasers, and Rotary lasers. Line lasers are used to create exact vertical or horizontal lines and often come with self-leveling features. Point lasers are used to create precise right angles for accurate reference points from the floor to the ceiling. Rotary lasers are used to produce a level laser line around a space in 360 degrees. 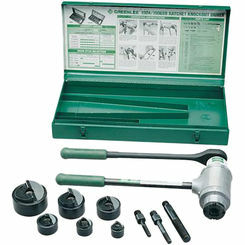 Save on the best specialty hand tools available online when you shop with PlumbersStock. 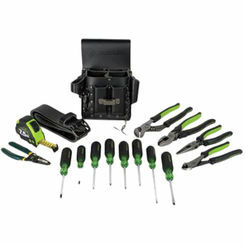 Order now and enjoy fast shipping, great prices, and excellent service and get your home improvement project under way in no time with new hand tools.